Nokia and Xiaomi have signed a multi-year patent licensing agreement. Xiaomi also acquired patent assets from Nokia as part of the transaction. The deal also includes a cross-license to each company’s cellular standard-essential patents. Under the business cooperation agreement, Nokia will provide network infrastructure equipment aimed at data center operators. Nokia and Xiaomi will work together on optical transport solutions for data center interconnect, IP Routing based on Nokia’s newly announced FP4 network processor, and a data center fabric solution. In addition, the companies have agreed to explore opportunities for further cooperation, in areas such as Internet of Things, augmented and virtual reality, and artificial intelligence. In addition to smartphones, Xiaomi has also forayed into Internet of Things and the Mi Ecosystem IoT platform has crossed 60 million connected devices, and there are now over 8 million daily active connected devices on the Mi Ecosystem platform. Lei Jun, chairman, and CEO of Xiaomi said, As a company seeking to deliver more exciting technological innovations to the world, we are excited at the opportunity to work more closely with Nokia in future. Xiaomi is committed to building sustainable, long-term partnerships with global technology leaders. 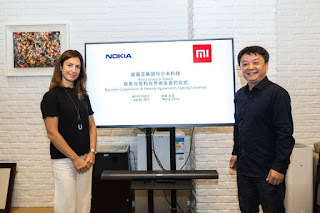 Our collaboration with Nokia will enable us to tap on its leadership in building large, high-performance networks and formidable strength in software and services, as we seek to create even more remarkable products and services that deliver the best user experience to our Mi fans worldwide. Rajeev Suri, President & CEO of Nokia said, Xiaomi is one of the world’s leading smartphone manufacturers and we are delighted to have reached an agreement with them. In addition to welcoming such a prominent global technology company to our family of patent licensees, we look forward to working together on a wide range of strategic projects.